Great Summer Programing at Ralph Myhre Golf Course! Take a look at some of the great programing this summer at Ralph Myhre! Monday Senior Men’s Golf: May 1st through May 31st: Tee times beginning at 1:00 pm. Please arrive 15 to 30 minutes early to join the group. *Starting on June 4th, tee times will begin at 10:00 am. 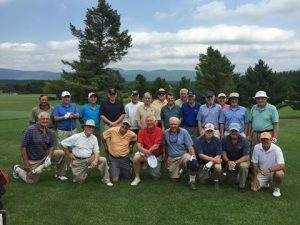 Bill Davidson Men’s Thursday Golf: 1:00 pm shotgun start every Thursday. Call the Golf Shop 802-443-5125 before noon on Thursdays to sign up for this weekly event. Friday Night Mixer: 5:00 pm beginning Friday, May 25th: Front nine shot gun event. $5.00 entry fee – $5.00 cart fee (if used) – non-member greens fee $15.00. Please sign up on Golf Shop Bulletin Board and check in early for head count. Singles are welcome!